We hope you have all been keeping well. So, as it’s Thursday and we haven’t posted in a while (sorry about that, a combination of births, deaths and marriages) We thought we’d take this time out to introduce one of the features we want to share with you all on a regular basis. If your not familiar with the social media phenomenon, #ThrowbackThursday is essentially an excuse for folks to reminisce about the good times they may have had in the past and are usually accompanied by baby photos. Well, you’ll have to wait a while to see any kiddie photos from us, partly because we were ugly as sin as kids (although we’ve aged well, like fine wine I hasten to add) but mainly because instead, we decided to use this as a way to do what we love, which is namely to take about the movies, comics, animations and TV shows that shaped our childhood and adulthood. The things that left us speechless and inspired us to becoming the raging geeks that we are! So to start us off, I thought I would share with you the love I have for John Woo’s classic 1989 action thriller, The Killer. The first time I saw this film was waaaaay back in 1995. I was a fresh faced 1st year student at sixth for college, amongst my interests at that time was Hip-Hop music, smoking copious amounts of weed, and listening to Hip-Hop whilst smoking copious amounts of weed. One album particularly touch my conciousness whilst in my mind soared; Enter The 36 Chambers by Wu Tang Clan. It was an album I’d Listen to regularly in between classes and sometimes in them (try getting through a class about microeconomics without your favourite music playing, go on I dare you) So I felt pretty well versed in all things Wu Tang. As I continued my listen experience, I realised that Raekwon made reference to a film that I had never heard off, The Killer. Now coming from a family that adores Martial Arts films (my mum takes great pleasure I mimicking Bruce Lee’s signatory battle cry) I couldn’t understand why I hadn’t heard of this film before. I felt pretty well educated where Hong Kong action cinema was concerned but this film must have slipped by me somehow in a haze of marijuana smoke. During my Film Studies class the following day, I spoke to a class mate about this mythical film and explained that I hadn’t seen it. The look he gave me in response closely resembled they kind of way you would look at a pitiful fool, so deluded and confused that you don’t know what to say next for fear of breaking their fragile spirit. He then did something that I will never forget; he told me that he had just received his copy of the film back from a friend, and was willing to lend it to me. That evening, I retired to my bedroom/cesspit with some fried chicken and orange juice, a few joints and a stomach swirling with excitement. I popped the tape into my VCR and proceeded to be blown away by 110 minutes of some of the most thrilling, emotional, gut-wrenching action I had ever seen. I was introduced to Jeff (Ah Jong), a modern day Ronin. The references to Alain Delon’s character from Le Samourai were instantly recognisable. But Jeff had something else, a passion, a level of emotion I had never seen before in a man of so few words. In the steely gaze of actor Chow Yun Fat (who I affectionately refer to as ‘Uncle Chow’) Jeff was a man who channelled the greatest elements of Clint Eastwood’s ‘The Man With No Name’ but with distinctly eastern sensibilities. He was driven by a code of honour that only a fellow warrior could truly understand. Jeff is a man who is weary at the world and as a professional killer, has grown tired of the bloodshed that follows his every move. He wants out, so after meeting his contact in possibly the most iconographic church you’ll ever see on film, he decides that his next job will be his last. He proceeds to carry out the job in a blaze of bullet flying, slow motion glory, blasting away Triads left and right. But as is always the case, the job goes horribly wrong and nightclub singer Jennie (the lovely Sally Yeh) is inexplicably blinded by Jeff. Struck down by guilt, Jeff feels honour bound to help poor Jennie and strikes up a relationship with her. When he rescues Jennie from a group of thugs one night, their feelings towards each other grow and love begins to blossom. When it’s later revealed that a cornea transplant could save her sight, Jeff vows to perform one more hit for his Triad boss then leave the life of violence forever. He carries out the assassination but is pursed by dogged police detective Li Ying (Danny Lee) and is double crossed by his greedy bosses. As Li continues to hunt down Jeff, a bond forms between the two men and a classic Jon Woo stand off between the two only seems to heighten the feelings of love and respect. When Jeff is betrayed by his contact and only real friend, and screwed out of the payment he so desperately needs, the film races towards it’s bloody climax, with a shoot out so dramatically over the top, only Woo’s later work on Hard Boiled can surpass it. Jeff, dressed in an iconic white suit with black tie delivers cold hard justice from his twin hand guns like a twirling angel of death. His shotgun is no ordinary weapon, it is a roaring cannon of retribution, sweeping away gangsters in the blink of an eye like some demonic being. I wont spoil your potential viewing experience by going into to too much detail about what happens, but the dramatic, devastating climax left my young fertile mind reeling. The beautiful cinematography from Peter Pau (who would later win an Oscar for his work on Crouching Tiger, Hidden Dragon) brilliantly captures the steel and concrete jungle that is 80’s Hong Kong. Danny Lee is great as the determined Detective Li and Sally Yeh sparkles as Jennie, but the stand out performers from the film are Chow and director John Woo. The action set pieces are spectacular and Uncle Chow delivers menace, pathos and tenderness like only he can. From the moment the movie ended to this very day, I have followed their careers in a way that is frankly a bit scary if I stop and think about it too long, but the imprint this film has left on my mind is immovable. I once went to Halloween party dressed as Jeff in white suit and black tie, for some reason everyone thought I came as Michael Jackson. Then it was my turn to give the poor misguided fool look to those souls who had missed on the beauty, chaos and genius of The Killer. Well, thanks for indulging me on my trip down memory lane, if your a fan of the movie, let me know and we can reminisce together! You can leave a comment in the section below or give me a shout on Twitter and we can all stride out to meet our enemies, a 9mm hand gun in each fist, a black tie wound tightly around our left arm, prepared to meet our fate. 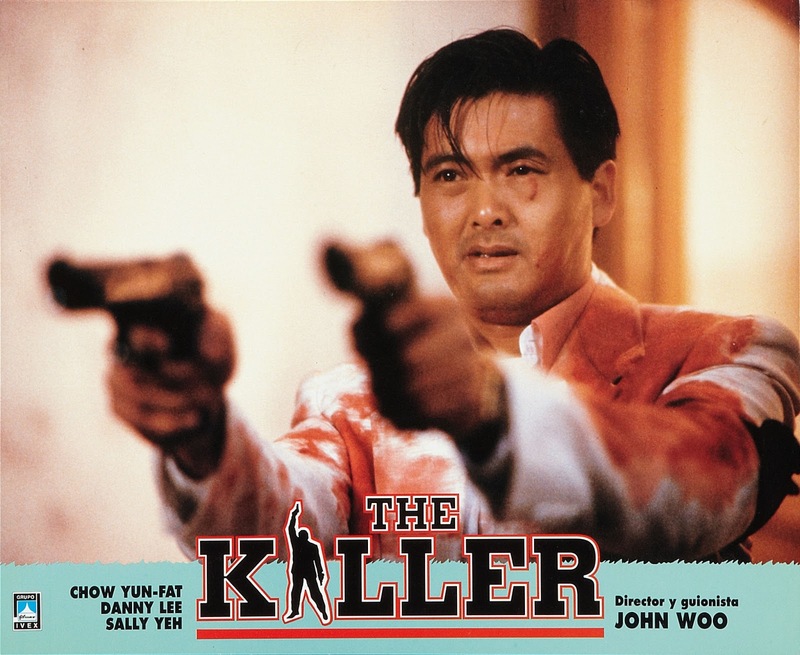 I hope you enjoyed this 1st ever #Throwback Thursday post, and until next time, see you Space Cowboy..
Chow Yun Fat delivers justice in The Killer! Previous Previous post: A short introduction..